The new report “How to create higher performing, happier classrooms in seven moves: A playbook for teachers” tells stories of teachers who improved student engagement and academic results by introducing seven specific, practical moves into their classrooms that replicate the successes of top managers in cutting-edge workplaces. For the next three months, we’ll be doing deep dives into each of these important moves. The first move for creating a dynamic classroom culture is teaching mindsets. Let’s be honest, the first thing America’s leading organizations do to create amazing teams is to hire amazing people. Some would say that teachers are at a disadvantage right from the start, as they lack the power to select their dream team of students to fill their rosters each year. But well-run organizations do not depend on hiring alone to build their teams. Nearly all of the cutting-edge organizations that we reviewed for our report said that they make a big effort to articulate, nurture, and demand a set of core values and dispositions among their employees through carefully designed structures and manager/employee interactions. We call these core values and dispositions mindsets. A mindset is a mental attitude or inclination that predetermines how a person will respond to a given situation. Well-run organizations take intentional actions to ensure that their people will respond to situations according to the organization’s values. Schools usually can’t select for these mindsets in advance of enrolling students. Luckily, however, mindsets can be taught. So teachers must be smart about embedding activities into the student experience that nurture the mindsets that their students will need. Mindsets are about students learning to learn—a vital prerequisite to mastering academic content. By nurturing mindsets, teachers empower their teams of students. But how do you teach mindsets to very young children? 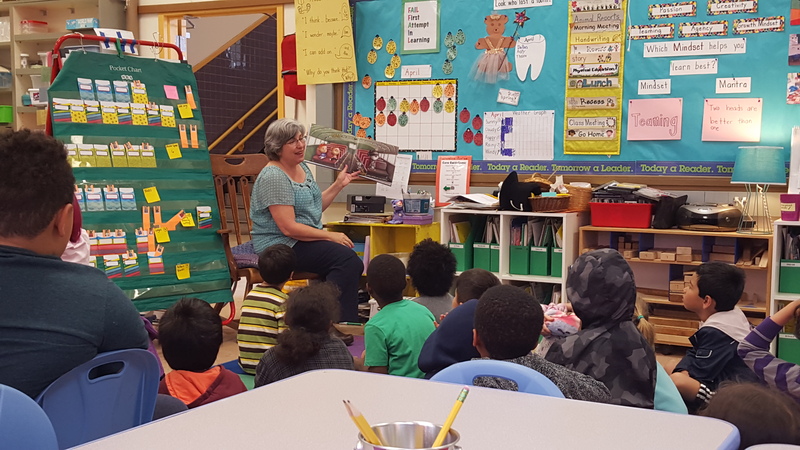 At Redwood Heights Elementary School in the Oakland Unified School District, Rebecca Weissman and Linda Rogers taught mindsets to their 1st- and 2nd-graders by first introducing and framing the mindsets upfront so that students understand them and then reinforcing the mindsets with posters, shout-outs, co-assessments, and a common language. Rebecca and Linda used children’s literature as a starting point for introducing each mindset and then followed this up by developing a mantra—a simple statement or slogan—to serve as a reminder. For example, to introduce passion for learning, the teachers read aloud Rosie Revere, Engineer and then discussed the protagonist’s passion for inventing gizmos and gadgets and her dream of becoming a great engineer. They asked their students how Rosie’s passion for engineering helped her keep going, even after her flying contraption didn’t work. After serious discussion, they decided that Rosie’s passion helped her not to quit. 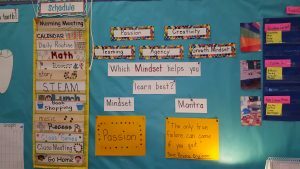 Rebecca borrowed from the book to develop a class mantra for passion: “The only true failure can come if you quit.” She and Linda posted the mantra on wallboards to remind the class that passion was their focus for the week. Usually, the class noted that characters in the books showed more than one mindset; this observation helped them understand that mindsets are interrelated. After introducing each mindset, Rebecca and Linda wanted to reinforce them through celebration. Rebecca created the Mindset Box and invited students to write down the name of a classmate who was showing one of the mindsets and slip the paper in the box. 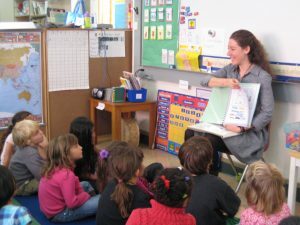 Each day she would read out at least one name from the box, call the student to the front of the class, give one large clap as a class, and then send the slip home for the student to share with his parents. Another way Rebecca and Linda reinforced each mindset was through co-assessments. 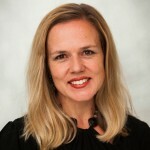 Rebecca, for example, sat down with her students in January, March, and May to co-assess their mindsets. She told the students about each box on the co-assessment rubric she had developed and then asked them to determine which box they thought reflected their status. Rebecca could complete a full round of co-assessments in one week; she met with seven students per day for seven minutes each. 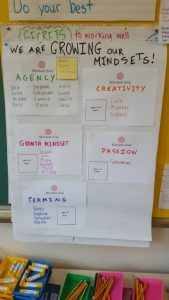 Rebecca and Linda also made a continual effort to reinforce the mindsets through the way they talked to their students. It was the little things that kept the mindsets front and center. When Rebecca read her class books or discussed history, she looked for opportunities to say something like, “Oh wow, this character showed growth mindset just then. 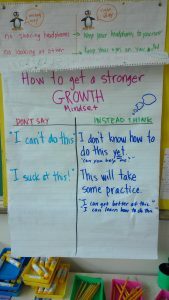 Can you spot another time when he showed the same mindset?” Her students got better at noticing mindsets themselves. One student pointed out that she had to use agency to manage her time better during reading rotation. Celebrations also helped reinforce the language. Rebecca frequently called students to the front of the class and asked them to stand on a makeshift platform that she called her stage. Using a marker as a pretend microphone, she’d announce, “Ladies and gentlemen, this student just completed his goals on ST Math. Tell us how you did it, Jake. What mindsets helped you?” This ended with a round of applause. As Rebecca and Linda’s very young students grew comfortable with the complicated skill of evaluating and improving their own mindsets, it became easier for the teachers to trust that they could give the students more choices and control. Students began to complete projects without teachers micromanaging them, and student engagement shot up. The teachers felt less tired. They also felt more connected to their students and aware of their individual lives. Students developed more hope and self-efficacy.